A carport and verandah combination designed and installed by Outside Concepts Eastern branch has made this happy owner really feel like king of the castle! 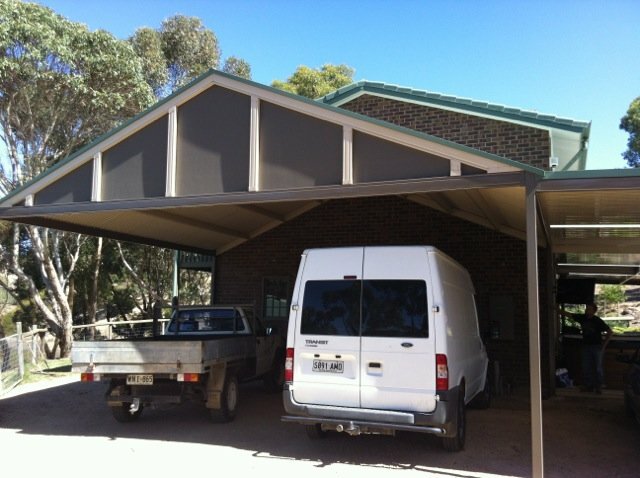 Built in Lysaght Firmlok with double sided Colorbond roofing (Wilderness/Paperbark) this mighty carport was designed with extra height to accomodate the owner’s truck and work vehicles. The customer chose the Colorbond colour Jasper (have a look at the colour here) for the posts and surround beams and teamed all other beams in Paperbark. A perfect combination to enhance the bricks of the existing structure while preserving the reflected light in the verandah area. In this particular castle, the gable end of the carport has been infilled, adding weather protection and enhancing the aesthetics of the structure by providing a feature. 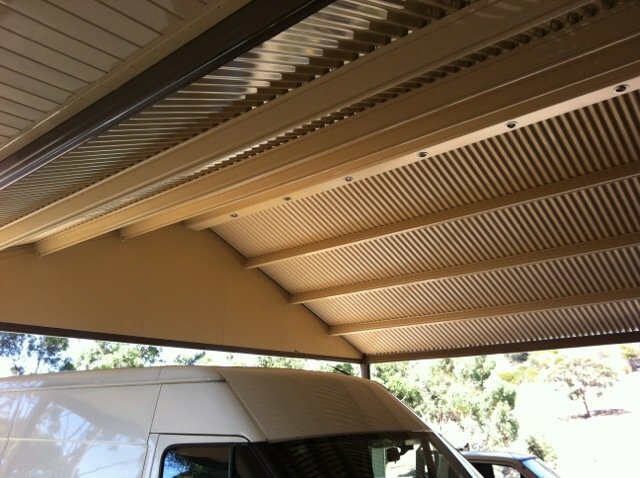 Here Outside Concepts franchisee, Jock Dean has added contrasting vertical cover strips and LED down lights on the underside of the carport roof. The adjacent 17 metre verandah has been constructed using Lysaght Living Collection with Flatdek Colorbond Roofing. If you want to feel like the king of your castle, call us today for a free-onsite quote!